Semuc Champey &Tikal, Guatemala Pictures! It’s easy when you spend a large amount of time in a section of a country to start to forget that there is so much more to a place than its tourist centers. The US is not just New York, the Grand Canyon and Orlando just like Australia isn’t just Sydney and Ayers rock and Guatemala certainly isn’t just Antigua and Lake Atitlan. Two weeks ago we headed north from Atitlan towards the next destination on our Guatemala hit list, Semuc Champey. The 14 hours of bus rides (including breakdowns) took us through a completely different type of country. Steep rolling hills of dense jungle, rusted corrugated steel and wood shacks perched precipitously on cliff sides and children carrying 50lb loads of firewood from headstraps trudging up mud roads. This is what much of Guatemala still is. For a country with so much natural beauty and such amazing history and culture, government mismanagement and instability has left the country way behind other developing countries in infrastructure and education. A surprising 75% of Guatemalans still live below the poverty line. The primary roads through the country between major cities and landmarks are largely unpaved and a trip that would take an hour on a US freeway takes 8 hours on dirt roads littered with potholes, rocks and ruble. The next phase of our adventure was beginning and it was obvious. To Lanquin we traveled. The town of Lanquin is a small rural town at the end of a long winding gravel road that takes an hour and a half to traverse its 9 kilometers. Not quite at the end of the road actually. At the end is one of the most beautiful places on Earth, Semuc Champey. As the river Chabon comes down through the mountainous jungle, it crashes furiously into a subterranean cavern for a quarter mile before resurfacing. Atop that cavern are a series of limestone pools filled with turquoise waters that tier one into another like emerald steps down the mountainside via dozens of cascading waterfalls. A sacred place to the ancient Maya for good reason, we spent our day at Semuc climbing a nearby mountain to view the beauty from above before cooling ourselves swimming in its cool waters and exploring its various lagoons and grottoes. As if that wasn’t a good enough day, we also visited the amazing Kan Ba caves nearby. This tour involves swimming through the cave systems water filled chambers while holding candles overhead to view the stalactites and other structures in the same flickering glow its original visitors must have seen. It was spectacular. Climbing rope ladders up subterranean waterfalls and sliding down nature-made chamber to chamber water slides by candlelight the Goonie in us came out full force and that childhood sense of adventure and wonder boiled inside. It was our time.. down there. Leaving our thatched hut riverside hostel and heading north we went deeper and deeper into the Guatemalan jungle. Our destination… The Mayan ruins of Tikal. Us both being huge history buffs, big fans of Indian Jones and having recently read The Lost City Of Z, we were ready to experience the Mayas lost city in the Jungle. Machetes in hand (not really) we headed into the ruins midday to avoid the crowds and sure enough our group were the only ones in the entire preserve. Wandering from step pyramid to step pyramid on dirt paths through dense jungle in the late day failing light was awe-inspiring. We climbed to the top of Temple 4 and watched the sun set over the jungle with the orange glowing tops of other pyramids staring at us over the field of green. The Mayans aligned everything astronomically and as we walked through the ruins at night under the stars you just felt a sacred sense of in-tunement with the world around us. It was awesome. Leaving Guatemala after a month we definitely felt a bit of sadness but Belize and the beach were in our immediate future and that put an internal smile on our faces as we boarded yet another bus for another unpredictable overland journey. This morning we swam in the Caribbean on the island of Caye Caulker. But that’s a story for another post. Until next time. 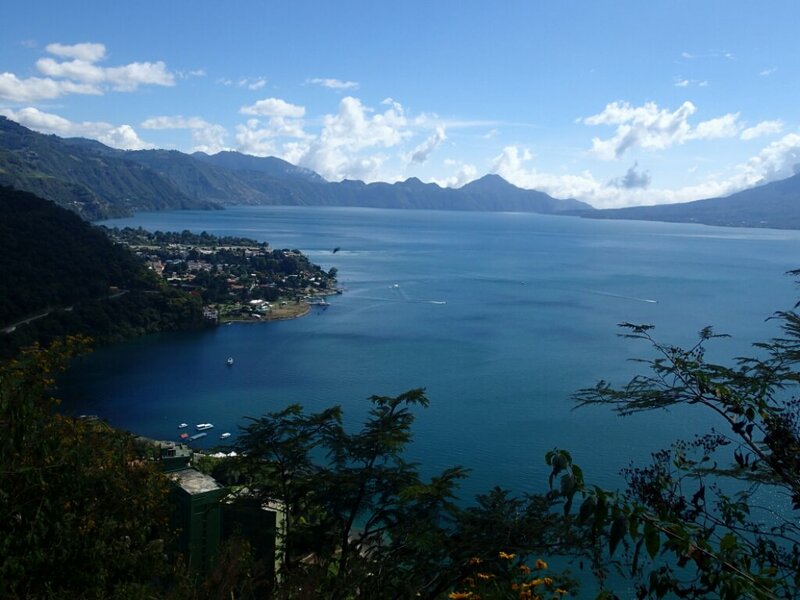 Lago de Atitlan, Guatemala Pictures! A week ago we were still in Antigua, Guatemala. Life was challenging us and we took it on the chin more than a few times. Especially Laura. That is part of traveling. Hell it’s part of life. But with every challenge and every down moment we find that there’s at least one reward/vindication moment that reminds you why it’s all worth it. This week has been just that. After leaving Antigua Guatemala last Saturday we made our way to the enchanting Lago de Atitlan. The volcano lake. Itself a collapsed volcanic cone, the pristine blue lake Atitlan, a spiritual Mayan location for thousands of years, is ringed by three great volcanos creating one of the most spectacular natural locations imaginable. Along its shores and in the surrounding hills survive a dozen small villages and a minimal amount of outside development. “Lanchas” or small open air motor boats are the primary means of transport on the lake as roads scarcely exist. Arriving in San Pedro, one of the largest villages and one of two gringo-ized towns on Atitlan, we reached the hotel we had booked the night before on the internet. Wow. The “bungalow” we had been promised was in fact a shack made of scrap wood with cardboard ceilings and structurally incorporated duct tape. Seriously. Large gaps in the walls were filled with crumpled paper and plastic bags to keep the insects out; what a joke that was. Deciding to tough it out for the night, we found ourselves hiding under our sheets as the room quickly filled with giant brown and black spiders once dark struck. They still haunt our nightmares. Waking up at 7am and looking for an immediate change, we left the tuk tuk filled street of San Pedro and our amazing shack in search of greener pastures, something we hoped would be easily attainable. Village hopping around the lake on lanchas all day we discovered the spectacularly gorgeous village of Santa Cruz La Laguna and it was love at first sight. We moved into our small room at the idyllic Iguana Perdido on the shores of the lake. Our beautifully rustic room with sweeping views of the lake, the docks in front dotted with Mayan children fishing with fishing line wrapped around tin cans, and the twin giants Volcan Toliman and Volcan San Pedro directly across the water from us, was a mere 100 quetzales a night, about $12 US. This week has been a piece of heaven. Studying Espanol in the mornings on a lakeside patio, swimming in the lake off secluded docks with new friends and hiking from village to village in the afternoon. The community dinners served at large tables by the water by candlelight with locals and travelers from throughout the world turn into amazing and inspiring conversations of life, travel, the world and adventure. Spilling out by the fire pit at night under millions of stars over the lake, most nights we get treated to dazzling light shows of lighting striking the tops of the volcanoes across the lake every few seconds. Loose shirts and shorts are the norm as the temperature on the lake is typically 70-80 degrees Fahrenheit. Late nights eventually turn into large groups drinking beers and mezcal around whichever collection of talented musicians decides to put on a concert for the night with the guitars, banjos, piano, etc. that fill the common spaces of the Iguana. Every night someone new, a local, a traveler, whoever, seems to blow us all away with a performance that sets the heart in motion. I can’t even put in to words the dynamic here, the community, the music and the shear beauty of the place. It’s inspiring on so many levels. Our friend Roland who joined us in Antigua (and is traveling with us now) will join us this next week as we make our way north to Semuc Champey. A collection of turquoise river fed pools in the middle of the jungle that tier into each other down the hillside through the two dozen waterfalls that connect them. Should make for a great swimming/adventure spot as we make our way further north to the spectacular Mayan ruins of Tikal. This is why we’re doing this. This is what we needed to be doing with our lives. We’ve been in lovely Antigua Guatemala for two and a half weeks now . Antigua is a small city surrounded by mountains and volcanoes. 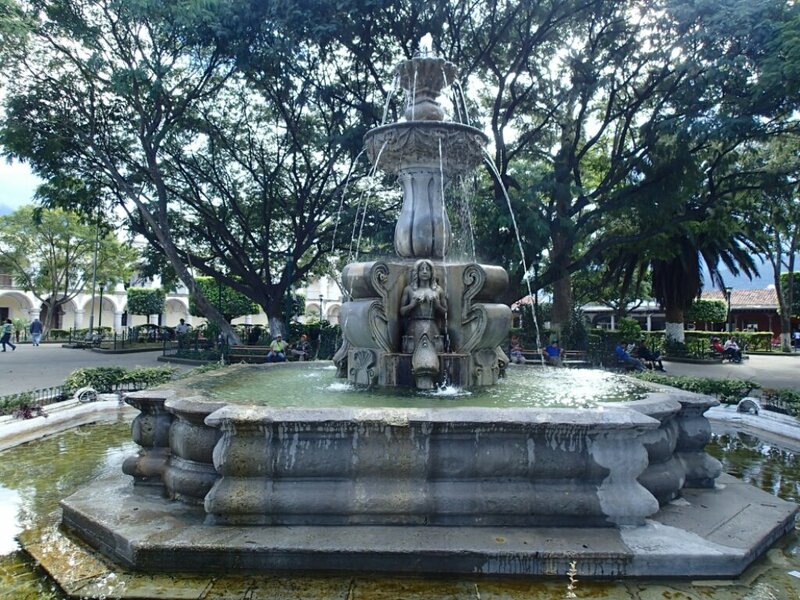 It is located about an hour outside of Guatemala City. Our first week here was mostly spent acclimating ourselves to the city and appreciating finally being in our first location on this great journey. This week however, has been less than perfect. I got terribly sick and had to get on an antibiotic regimen for 3 days. On top of that I was the victim of a random wild dog attack. Yes you read that correctly, I was attacked by a wild dog on the streets of the fair city of Antigua. Luckily I only suffered minor injuries and was able to recover after only a few days. Dan has been experiencing major migraines due to technological and internet issues, including getting locked out of all his email and internet accounts due to logging in internationally. Just yesterday we thought the ceiling of our room was literally going to cave in. At that point we finally just had to start laughing. Besides all of that mess, we’ve had a wonderful time at Spanish school, meeting new people and learning more about the Maya culture. 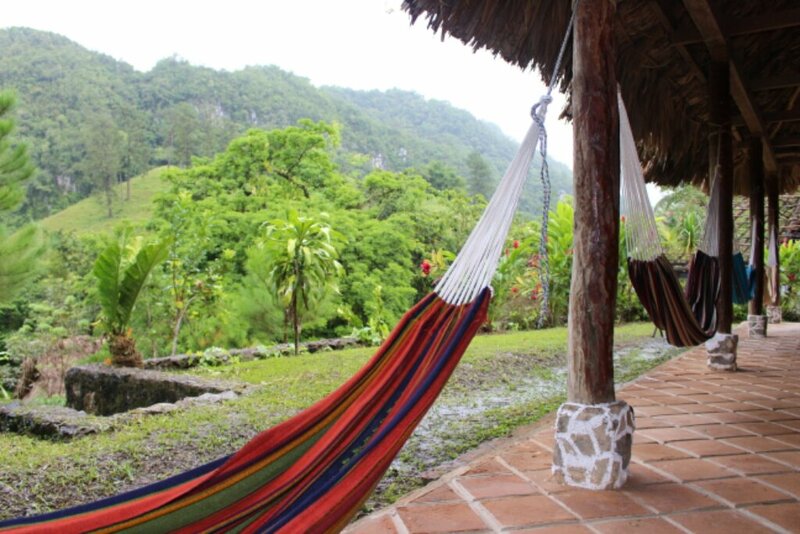 Some of our activities include the All Saints Day festival weekend, a visit to a macadamia nut farm, hiking up to el Cerro de la Cruz, visiting Ciudad Vieja at the base of Volcan de Agua and visiting a Maya pueblo where we were taught how to make tortillas by hand. Overall things are going well and we are excited to be traveling on to San Pedro and Lago de Atitlan next week.